As the polar vortex rips through North America, we thought to ourselves, “What could be more appropriate than a market report on sunny Cyprus?” And with that, we present a well-rounded snapshot of this Mediterranean island nation. With a turbulent history, Cyprus has endured multiple occupations by foreign powers and a recent economic collapse. The island split violently in 1974 and remains partitioned today, with a United Nations buffer zone running directly through the capital of Nicosia. On the south side is the Republic of Cyprus, and to the North, unrecognised as a state by the international community (except for Turkey), is the self-proclaimed Turkish Republic of Northern Cyprus. Though the nation has an unsettled past, and political sentiment runs the gamut from reunification to permanent divorce, present-day Cyprus’ educational market is somewhat less unpredictable. Cypriots are educationally equipped, highly mobile, and the Republic of Cyprus is linked to the EU by treaty. It is also a country with plans to become a hub for English instruction. Cyprus is a well-known travel destination with signs of human occupation stretching back into antiquity. It receives over 2 million visitors a year, making tourism one of the economy’s tent poles. Those who visit find an island that is safe, sunny, and offers modern services. Despite that, arrivals have been down from January 2013 till August, due to difficulties related to the Euro crisis, uncertainty, and image problems for the country as a result of negative press. For example, Paphos (a popular resort area drawing in approximately 33% of the island’s visitors and appointed European Capital of Culture 2017) registered over 540,000 tourists from January 2013 until August, a 6% drop compared to 2012. All of Cyprus is fighting a downturn. While the Republic of Cyprus, with an economy based on the Euro, has been forced to enact EU austerity measures, the North operates using Turkish currency and receives hundreds of millions of Lira in cash aid annually (up to 38% of national revenue in 2008). But Ankara is pushing austerity measures as well. Thus even in division, both sides of the island are in similar situations. A small bright spark recently appeared however, when the Cyprus Tourism Organisation (CTO) reported a 2.1% increase in tourism revenues for June, followed by a 12.3% increase for July, 12% for August and 21.9% for September. But visitor arrivals continued to fall compared to 2012. For example, in August arrivals from Germany were down 36.2%, Greece fell 25.5% and the UK dropped 13%. However, arrivals from Ukraine skyrocketed 85%, Russia rose 25.1%, and Israel jumped 22%. September was a strong month, with 357,653 visitors arriving to Cyprus: a 6.7% increase over 2012 – mostly due to strong arrivals from Russia and Sweden. And in October, arrivals were up 4.4%. The island is looking to key nations to help produce a turnaround in figures for 2014, targeting Russia, Ukraine, the UK (currently the strongest origin market), Germany, Kazakhstan, plus the Scandinavian and Nordic markets. Additionally, country officials met recently to discuss opening up flights between Cyprus and Kuwait, and Cyprus and the UAE, in order to improve tourism streams. Others are pushing for open skies agreements with China. And a new campaign drawing a lot of attention at London’s recent World Travel Market (WTM) is called “Summer is Cyprus” and is touted to be “The Biggest Holiday Competition in the World.” Over 50 four- and five-star hotels across Cyprus have united to award seven-night holidays on the island to 50 lucky winners (the contest runs for 50 weeks). Greek and Turkish are the official languages of the Republic of Cyprus, but English is widely spoken, and the island’s English Language Teaching (ELT) industry is growing. In 2009 there were 637 English language tourists, a number that has reached nearly 2,000 today, and which is expected to grow to more than 16,000 by 2020. Despite that growth, some observers see room for even more expansion if government regulations are eased. When speaking to the website Poliglotti4.eu, Yiota Kontoloucas, director of Malvern House Cyprus and the English Learning Centre in Limassol, highlighted the Republic of Cyprus’ growth potential by comparing it with Malta. She pointed out that Malta is nearly thirty times smaller than Cyprus yet is the fifth most popular destination worldwide for ELT, pulling in nearly 82,000 students in 2012. Constantinos Vassiliades, head of CTO, is working in collaboration with Republic of Cyprus tourism offices abroad to get agents and tour operators to tout the country as a destination for learning English. The English tradition there is very strong; English is compulsory from the age of 6, the language is considered an essential business skill, and there are numerous private English secondary schools. To address quality control, the English Language Schools Association of Cyprus (ELSAC) was recently created. The self-regulating body was formed by Malvern House, Xenion Education, and Pascal Summer Camps, and it oversees teacher qualifications and the efficacy of teaching materials, as well as non-academic issues such as student leisure, excursion, and entertainment. But if English language learning is to flourish, legislative changes may be needed. Those include official government recognition of the ELT sector and lengthier visas for ELT students. At the moment, non-EU arrivals can stay only 12 weeks, which means English courses are structured to last the same length of time. And because the sector is unrecognised, many potential foreign students do not receive visas, and some of those who do, struggle to renew them. Both regions of Cyprus feature public and private universities, and as a whole the island boasts a highly educated population. In the south, 47% of people aged 25-34 possess some tertiary education – the highest percentage in the EU. These students tend to be mobile, with 78.7% at some point studying in a university outside the Republic of Cyprus. The most detailed mobility information for the Republic of Cyprus comes from the Ministry of Education and Culture. Its 2012 Annual Report reveals that about 19,000 students were abroad in 2010/11. That number shows a sharp drop from its 2007/08 peak of more than 22,000, a decline probably attributable to the country’s economic travails. Traditionally, many parents in the Republic of Cyprus strive to send their children to university in the UK. The US is also a top destination for Cypriot students, and Greece is another popular receiver. However, ongoing Eurozone turmoil that has hit the Greek mainland has dampened demand for the destination. The upshot is that Cypriot students are looking toward non-traditional destinations. Among them are Canada and Australia, both of which are showing growth in receiving students from the Republic of Cyprus. Potential for post-schooling employment on Cyprus is of paramount importance, because strong family ties mean the majority of students return after completing their studies abroad. Brand awareness among families and students is high. Students currently cannot obtain bank loans, however the situation is described by sources on the island as temporary. The large number of international companies based on Cyprus means top areas of interest among students include accounting, law, business, and marketing. Russian language learning is an increasingly popular area of study due to the recent influx of wealthy Russians to the island. Cypriots tend to seek out compatriots abroad, which means schools located in cities with a Cypriot expatriate community may want to tout that fact. Learn and remember the background of the 1974 division, and understand that the issue is one of sensitivity. Higher education in Northern Cyprus is a delicate issue. Universities there are considered illegitimate by authorities from the Republic of Cyprus, and official websites describe them not only as illegal, but often constructed on confiscated land owned by citizens from the South. The Republic’s EU connection means that European political institutions also consider Northern Cyprus universities to be illegitimate. Nevertheless, northern universities have been aggressively marketing to foreign students, particularly in East Africa, resulting in high international student figures. 12,658 students from Northern Cyprus. The fact that the nine universities serving the North are not recognised by the Republic of Cyprus – and by extension the UN – is constantly reiterated to overseas governments in the sternest possible terms, but the North’s schools maintain ties with Turkey’s Council of Higher Education (YÖK), which awards its graduates degrees that it claims are internationally accepted. Northern schools have also earned international recognition independent of the YÖK, mostly from countries to the East, such as Pakistan, the UAE and Oman. But at least one school – Girne American University – has made inroads to the West. It maintains a satellite campus in Canterbury, England that has received the British Accreditation Council’s stamp of approval. Furthermore, it became the first school in Northern Cyprus to earn accreditation from the Evaluation and Accreditation of Quality Language Services (EAQUALS). Such acceptance contradicts the stance of the United Nations (Northern Cyprus is banned from international trade organisations, and its air and sea ports are open only to Turkey), but international politics and international education don’t always see eye to eye. As in other countries, economics and competition have led the Republic of Cyprus to re-examine its approach to education. There is a highly educated populace, but youth unemployment is at 44%. EU Education Commissioner Androulla Vassiliou recently stressed the need for Cyprus to encourage school leavers to take up vocational studies. To tackle youth unemployment, the EU plans to spend approximately €10 million in Cyprus as part of its Youth Employment Initiative (YEI), the goal of which is to prevent any European under the age of 25 from going four months without a job or an internship position. An important English-related change could be in the offing. A recent proposal, if approved, would give University of Cyprus applicants the opportunity to take specialised entrance exams in English. Right now, only those who have passed relevant GCE classes and those passing the Pancyprian entrance exam are eligible to apply. The change would allow applicants to choose between Greek or English for the exam, and ultimately would open the university to more private school students. Some Republic of Cyprus policymakers want to directly tackle the issue of the cost of an education. The Education Ministry has held discussions with parents’ associations and schools, and produced guidelines about fees and other charges. Education Minister Kyriacos Kenevezos asked private schools to reduce tuition fees, or at least forego the 1.4% increase to which they are legally entitled. In what some perceive as a radical move, the University of Nicosia, the island’s largest school, announced that it will begin accepting the digital currency Bitcoin as payment for tuition fees. This would make the school the first in the world to do so. University officials describe the move as help for foreign students in countries where traditional banking transactions are either difficult or costly. For more insights on new, alternate payment systems, see our related article. The discovery of natural gas by the Republic of Cyprus is perceived as a game changer for the island. The amount discovered is small by international standards, but is enough to meet local demand for at least the next 50 years. If exported, it could generate much needed revenue for the national budget. And there’s also the possibility that more gas fields could be found. While reunification of the island has always been a goal, years of negotiations haven’t produced progress. The gas discovery has prompted Northern Cyprus to demand some form of revenue sharing, but so far the Republic of Cyprus has rejected that demand. Complicating matters, the North has said it may consider asking nearby Arab states for official recognition, and Turkey has suggested that it may annex Northern Cyprus and make it an official Turkish region. In recent months, the United Nations has tried to bring the two sides into negotiations, but with so many other matters dominating international attention, little movement has occurred. The South and North failed to agree on a joint statement outlining the mission of reunification talks. Republic of Cyprus President Nicos Anastasiades had said such a statement was needed to avoid long, inconclusive discussions. In the end, the two sides walked away. Thus, for the foreseeable future the status quo seems likely to hold. 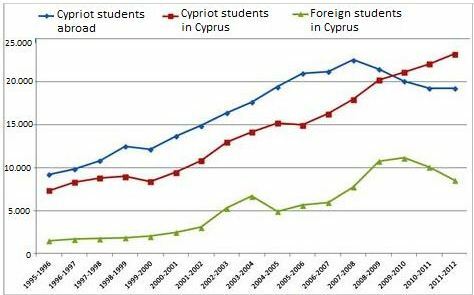 While a reunification would have an immediate impact on the education sectors of both South and North, and the gas discovery has roiled the political waters somewhat, Cyprus looks set to continue on its current course – one that for all its uncertainty produces some of the most mobile and motivated students in the region. This entry was posted in Europe, Higher Education, Language Learning, Regions, Vocational and tagged tertiary education overseas, student visas, exam prep, higher education statistics, Ukraine.